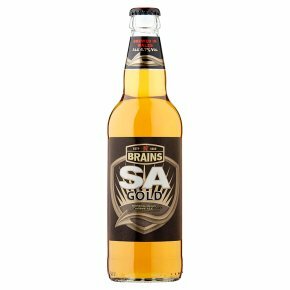 SA Gold is a full-flavoured, hoppy and refreshing golden ale, brewed at the home of the famous Brains brewery in Wales. First produced in 2006, this is deliciously satisfying and refreshing, late-hopped using Cascade and Styrian Goldings and suited to balancing out spicy foods such as Indian or Chinese dishes. Refreshingly hoppy ale.S.A. Gold is a full-flavoured, hoppy and refreshing golden ale. Hops are added late in the brewing process giving it complex and refreshing citrus aromas and flavours. Equally as delicious on its own as well as with food, this pairs best with light flavours such as white fish and cheese.